Classic Dash & Classicmustangz are stoked to announce our 2019 Instagram National Mustang Day Dash & Gauges Giveaway! Between now and midnight April 16th, cruise on over to the Classic Dash Instagram feed and enter to win a Mustang dash & complete gauge kit! Entering the giveaway is as easy as 1, 2, 3! That’s it! We will announce the one lucky winner on our April 17th National Mustang Day post. One entry per person. Winner will be tagged in the April 17, 2019 National Mustang Day post on Classic Dash’s Instagram feed and the winner will be contacted via direct message. Prize is non-transferable and must be claimed by May 17, 2019. – AutoMeter Ultra-Lite Gauges in either mechanical or short sweep electric. Winner directed upgrades or changes to the complete dash and gauge package will be the financial responsibility of the winner. Winners outside of the continental US will be responsible for shipping charges. Contest prize cannot be combined with any other offer, gift card or discount, and has no redeemable cash value. Winner cannot have won any prize from Classic Dash within the 365 days. 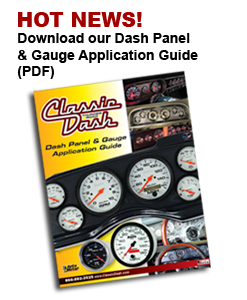 By entering this giveaway, the contestant agrees to hold harmless Classic Dash and Classicmustangz, and releases them from any and all liability due to damage to property or serious injury to person, resulting from the installation of the dash and gauges in the winner’s vehicle. By entering this giveaway, the contestant gives Classic Dash and Classicmustangz permission to use any images, comments or videos submitted for future promotions. This giveaway is in no way sponsored, endorsed or administered by, or associated with, Instagram.